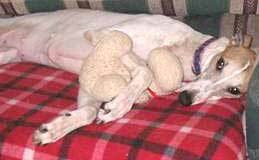 , until she was captured by GALT foster mom and volunteer, Pam Hart and her greyhound, Rex. 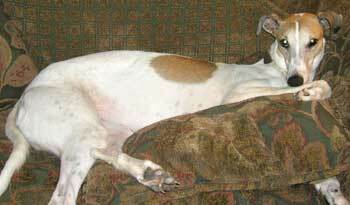 On October 13, GALT received a call from a woman about a stray greyhound in Mesquite. The grey had been hanging around the neighborhood for several days but was very skittish and scared. With much help from the neighborhood, Pam and Rex were able to locate her in the wooded area within two hours. Big, handsome Rex worked his magic, and she hopped right in the car and went straight to Preston Park Animal Hospital to see Dr. Ellis. She was named Brandy after the lady who had called GALT and had been feeding her. She was in the Hart foster home for several weeks, and made HUGE strides in trusting and asking for pets. Brandy is the biggest smiler ever and will bark happy greetings - she is not a nuisance barker, but just loves to say "HELLO". She is very submissive and is small animal and cat tolerant. Brandy often instigates play with the other hounds in her foster home.